Kenneth G. VanDerGeest, age 86 of Merrill, WI. 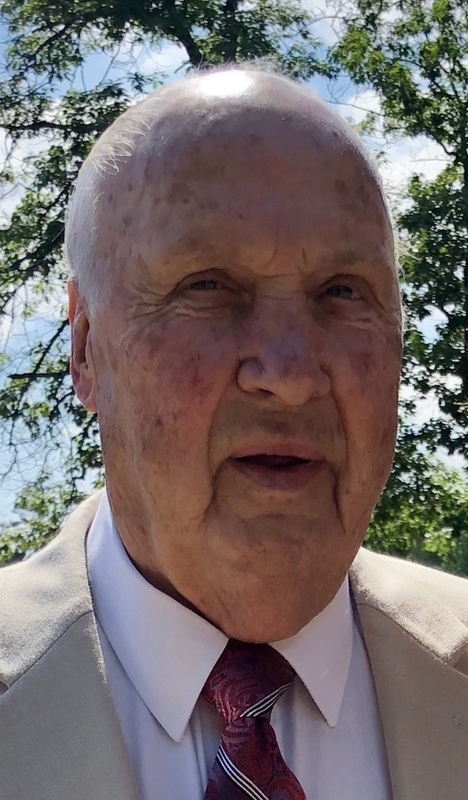 Kenneth G. VanDerGeest, 86, of Merrill, WI went to his heavenly home on February 8, 2019. Ken was born in Wausau, WI on October 8, 1932 to Joe and Anna VanDerGeest. Ken loved his family dearly and was very proud of each of them. His greatest joy was cooking prime rib roasts on his “special prime rib only” grill and sharing it with family and friends. His choice “hamburgers” were a tremendous favorite also. He had a passion for work. “To be able to work is one of God’s great gifts”, was his belief. He was the only person we knew that always looked forward to Monday morning. Ken worked tremendously hard to support his growing family. He owned and operated a small meat market in Antigo, WI from 1965 -1969. In 1970 he was offered an opportunity to be the first distributor for Tombstone Pizza and successfully built regional sales in the upper peninsula of Michigan. He retired in 1996 and pursued a new venture of opening accounts for Pep’s Pizza. As often happens, our greatest joys come later in life. Ken’s passion was driving a truck and delivering product. He felt so privileged to be able to drive for a company owned by one of his sons. In fact, he made his last trip 2 days before he left us. There always were dogs in his life. Chihuahuas, a Great Dane and everything in between found their way into his heart. His latest, Lacie, a Yorke, was his constant companion and was with him the last day Ken spent with us. Prior to his marriage to Mary Ann (Schewe) VanDerGeest on September 8, 1956, Ken enlisted in the US Air Force where he served from 1951-1955. He was stationed in Thule, Greenland for 1 year. He is survived by his wife of 62 years, Mary Ann, as well as 10 of his 13 children; Karen (Bob) Akey of Merrill, WI; Debbie (Bill) Groskopf of Nashotah, WI; Patti (Mike) Boyd of Merrill; Tim (Carol) VanDerGeest of Birmingham, AL; Jim VanDerGeest (Deana DeWan) of Wausau; Nancy (Johnny) Dewar of Merrill; Steve VanDerGeest (Kristin Akey) of Minneapolis, MN; Kelly (Jon) Leiskau of Merrill; Katie (Will) Yutuc of Merrill; Marci (Dale) Rankin of Tomahawk, WI; 26 grandchildren and 17 great grand children. He is further survived by his brother, Gerrit (Chub) VanDerGeest and sister, Marlene Stevenson. He was preceded in death by his parents, two brothers and a sister; two sons, Michael and Rick, a baby daughter, Catherine and grandson, Christopher Grubb. In lieu of flowers contributions can be sent to the Lincoln County Humane Society, Palliative Care Unit of Aspirus Hospital in Wausau, WI or the charity of your choice. A Mass of Christian Burial for Ken will be held on Wednesday, February 13, 2019 at 11 AM at St. Francis Xavier Catholic Church. Visitation will be held on Tuesday, February 12, 2019 from 4PM to 7PM at Waid Funeral Home and again on Wednesday at the church from 10AM until the time of service. Burial will be in St. Francis Xavier Catholic Church Cemetery. Military honors will be performed by the Merrill VFW Post #1638. Marlene, I’m so sorry for your loss. Marlene and the Stevenson Family, sorry for your loss. Praying for your family at this time of grief. Our condolences to all of his family, Marlene and the Stevenson family. So sorry for your loss, may your brother, uncle, rest in the arms of Jesus! We are so sorry. Our heart is with you as you celebrate the life of this special man. You are all in our thoughts and prayers.